Using chopsticks can be a breeze for some and incredibly difficult for others. Once you learn, however, the incredibly versatile Chinese utensil can become second nature. Using chopsticks can be an incredibly useful skill. Whether you’re on a date or a business meeting, being able to properly use chopsticks can make a good first impression. You don’t want to be the one who has to ask the waiter for a fork in front of everyone. But how do you properly use chopsticks? Read on and we’ll walk you through exactly what to do. The first step to chopstick use is to arrange the sticks in the correct position in your hand. Both chopsticks are the same, so there’s no need to try and differentiate between the two. Start with the first stick. Hold it in your hand as you would a pencil. Hold it so that the thicker end sticks out from the area between your index finger and thumb. The narrow end of the chopstick should sit gently on your ring finger. Then pick up the second stick and align it with the first. The thicker and thinner sides should match that of the first stick. The narrower end of this stick should rest between your middle and index fingers. It should rest against the inside of your thumb, but you shouldn’t need your thumb to actually support the stick. This new second stick will move, and the first stick will remain still as your base. Proper use of chopsticks involves moving the top stick up and down against the base stick. Your index and middle finger should be able to move the stick up and down, to meet the base stick and then away from it. This motion tightens the chopsticks grasp and loosens it. This motion will be what you use to pick up different pieces of food. Take a piece of sushi for example. With chopsticks in hand, you will lower them towards the food until the sticks are on either side. Then with middle and index finger, you will bring the second stick towards the base until it makes contact with the sushi. 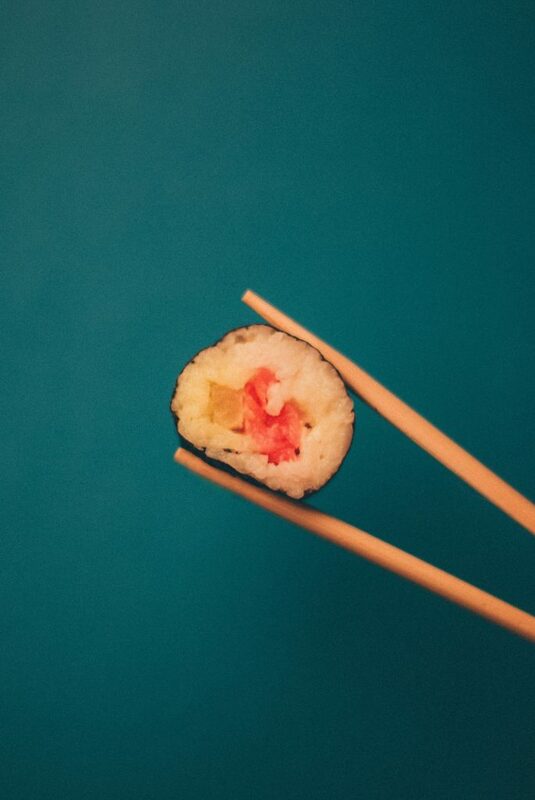 With the sticks holding the sushi tightly in place, you can raise it up and bring it straight to your mouth! Like anything, becoming a master of chopsticks can take time and repetition. It helps to start practicing with larger food items such as sushi, which is easier to grasp and lift. Once you feel as if you can pick up sushi or similar items, you can try for harder targets such as noodles or rice. These smaller foods are a bit trickier to lift with chopsticks but rely on the same model of use. Nothing is more embarrassing then struggling and dropping food when out to eat in a public place. Learning proper chopstick use is a great skill to have, and one that can make your meals more enjoyable. Check out our database of restaurant menus to find the best meal near you.